This 32 page booklet is an SGHT publication and is richly illustrated with photographs of vessels. It includes a map of South Georgia showing the sites of the wrecks and hulks and other vessel remains. 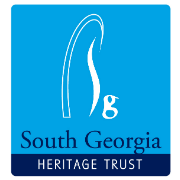 As South Georgia can only be reached by sea, its history is essentially a maritime one. 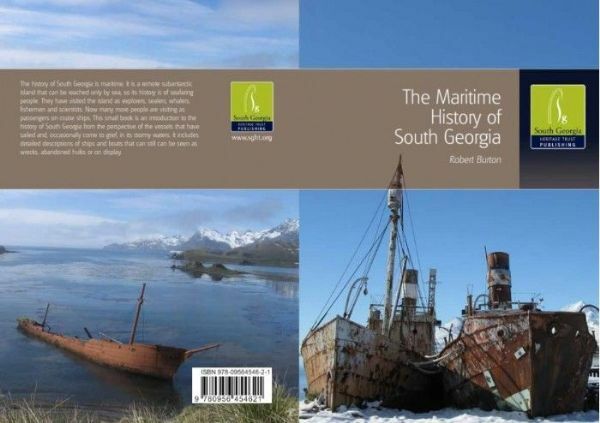 Mariners have visited the island as sealers, whalers, explorers, scientists, fishermen and tourists and in this small book the author Robert Burton introduces the history of South Georgia from the perspective of the vessels that have sailed, and occasionally come to grief in, its stormy waters. The booklet starts with the first sightings of the Island before introducing some of the expedition ships that visited its shores including Shackleton’s Endurance. It includes sections on sealing and whaling and on research ships from the Deutsche Atlantik Expedition ship Meteor to the current BAS ships. Military ships are also covered. The author points out that the early exploration ships used by captains Cook and Bellingshausen, and the German International Polar Year expedition were naval vessels. This section also includes the visit in 1905 of the Argentine naval transport Guárdia Nacionál bringing a cargo of coal for Grytviken whaling station and the timely arrival of HMS Dartmouth in 1920 when a number of workers at Grytviken went on strike, threatening violence, with the intention of establishing ‘the first Marxist republic outside the Soviet Union’. The cruiser arrived unexpectedly on a courtesy visit. Order was restored and the ringleaders deported. Vessels involved in the 1982 war are also covered, as are fishing vessels and tourist vessels. The later part of the book takes a look at those vessels that remain around the Island, from the small tow boats ashore in the whaling stations to the wrecks and hulks, before finishing off with a section on navigational aids such as lighthouses and a brief look at two vessels, Alert and James Caird, represented within the Museum at Grytviken.